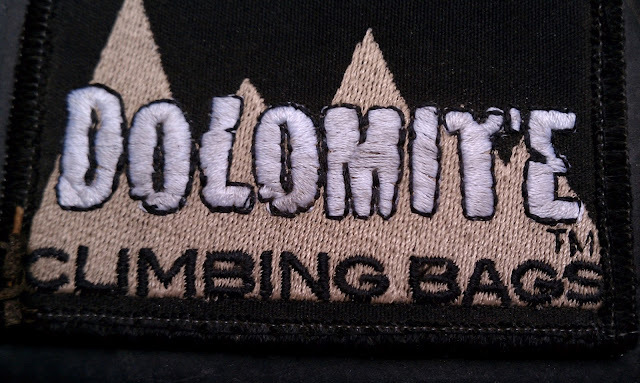 Bouldering is viewed by many as climbing in its purest and simplest form. Just you and the rock...well that and everything you carry with you. For some the solution is to just stuff it all into the pad...creating a potential for a trail of gear to pick up on your way out, or a sprawling mess once you set up at the blocs. For others, a bouldering bag becomes a necessity to keep yourself organized. Dolomite Climbing Bags is a small outfit based in Seattle, WA specializing in up-cycled bags. They were kind enough to send along the Basic Bouldering Bag for our review, not to mention they generously donated to the 3rd Annual Butte Bouldering Bash. 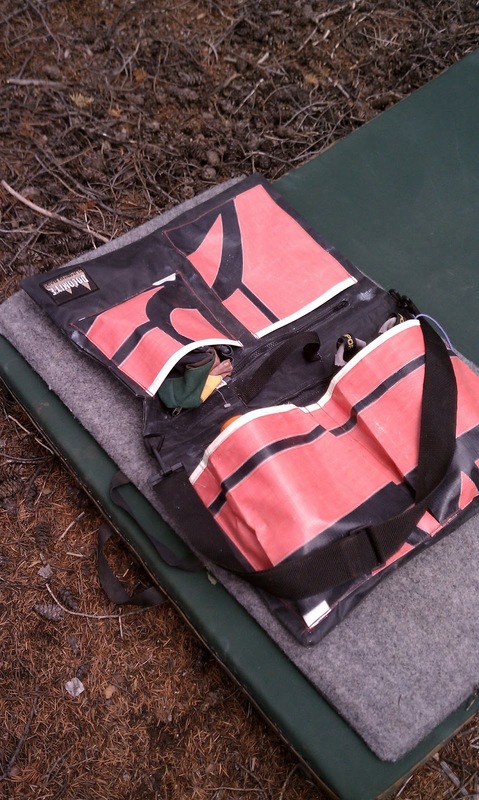 The bag is in the style of a messenger/saddle bag, with the ability to open up and lie flat in the bouldering pad. It's somewhat comparable to the Metolius Bouldering Bag in style. The re-purposed fabric initially feels stiff but burly...and the stiffness isn't necessarily bad, just different. The toughness of the fabric is great, especially among the sharp rocks of the Boulder Batholith. I also really like the idea of using re-purposed(up-cycled) marketing banners and cordura. Each bag is unique and living a second life. The bag features two large zippered compartments and pockets in front for quick access. The outside pockets are nice to be able to quickly tuck away your shoes or grab a water bottle, which is neatly stored and not isn't rolling off somewhere. Storage wise - there is ample space to fit shoes, water, chalk, brushes, and food with room to spare. There is also a small inner pocket along with a key keeper for small items, which I find very useful as I'm always convinced I *just* lost my keys. I dig the style and aesthetics of the bag, and it's cool having a choice on fabric patterns, I ended up with some glow in the dark accents...a pretty cool addition. The construction is bomber as well, with sturdy stitches and burly zippers, overall it feels solid. As a minor quibble, I'd like the see the should-strap connection just as burly, but currently it seems to be holding up just fine. 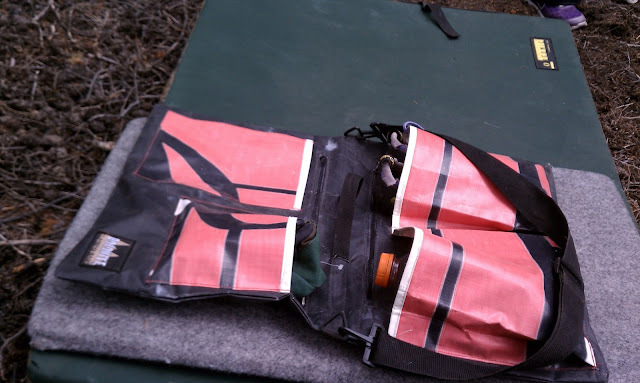 I mainly used this bag in conjunction with a bouldering pad, Though bag also carries nicely in the messenger bag configuration with a shoulder strap, making it easy to go from the boulders to the gym with the same bag. While it would work for a scouting mission, a day exploring without a pad I might opt for a traditional style backpack. I put this bag through some freeze-thaw torture, often times it would end up on the porch, garage, or left in the rig. I was nervous about the material becoming brittle, but so far the material seems just as solid as when I initially picked it up. In fact, there is very little, if any, wear to the fabric...this stuff is burly! The fabric also remains rather stiff...but over time I have gotten used to the 'feel' of the bag, and the stiffness doesn't seem to be an issue, it's just a bit different. Not a great option for long hikes without a pad. Overall, if you're looking into picking up a bouldering bag, this is a great option. A quality product, utilizing up-cycling practices, and based in the USA.